Liverpool and Roma have been charged by Uefa following crowd disturbances at the sides' Champions League semi-final first leg at Anfield last month. 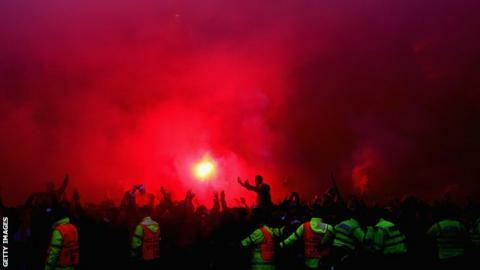 Liverpool have also been charged with setting off fireworks and throwing objects. The Reds won the first leg 5-2 but the match was marred by violence before kick-off with nine men arrested. Two Italian men were charged on 26 April after Liverpool fan Sean Cox was left seriously injured. The case will be dealt with by the Uefa control, ethics and disciplinary body on 31 May. This month, both sides were also charged for setting off fireworks at the second leg, while Roma were charged for insufficient organisation, blocked stairways and the improper conduct of owner James Pallotta. Liverpool were already facing charges after Manchester City's team bus was attacked during the Champions League quarter-final first leg. That matter will also be heard on 31 May.